A blast from the past for anyone who went to school in the nineties. 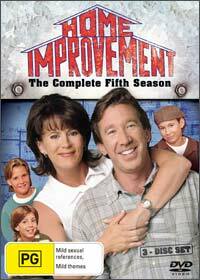 The series follows Tim “ The Tool man” Taylor (Tim Allen), the accident prone hot of a DIY show as he balances his professional and family life. Tim Allen dominates most of the plot lines with his clumsy antics and outrageous machines which always backfire on him. But Tim's best friend/conscience Al (think Jiminy Cricket in flannelet with a tool belt) balances out Tim's wacky Homer Simpson-esque qualities. There is also Tim's neighbor and person oracle Wilson, who once per episode explains things in a simple and unique way, ultimately leads to the conclusion. For the amount of content on these discs, the special features are surprisingly sparse; For 26 episodes, there is only a blooper reel which consists of bloopers seen at the end of most episodes in this season. Home Improvement works as a basic half hour family sitcom. Unfortunately if you are over 11 years old, watching Tim Allen repeatedly hurt himself may become more annoying than funny. This one is definitely one for the fans!